Sommer has the quietest Garage Door Opener on the Market. Unlike conventional garage door openers that use a noisy chain, belt or screw Sommer has only one moving part with no moving chain or belt.The motor glides silently along the stationary chain that is embedded in an indestructible steel rail, creating the quietest garage door opener available. Now get the 1HP model at a price for a 3/4 HP model! 2 HP Belt Drive Garage Door Opener The Ryobi Ultra-Quiet Garage Door Opener boasts a 2HPs motor, giving you faster openings and prolonging motor life. An integrated long-lasting LED light keeps your garage illuminated and ensures you don't spend time changing out light bulbs. Download the Ryobi Garage Door Opener App to monitor and control your garage remotely from your smartphone. Ensure your opener functions, even when your power fails, by connecting any Ryobi ONE+ battery. Add any one of the Ryobi Garage Door Opener Accessories to customize your garage with the ability to do everything from playing your favourite tunes to having lasers ensure you park perfectly every time. 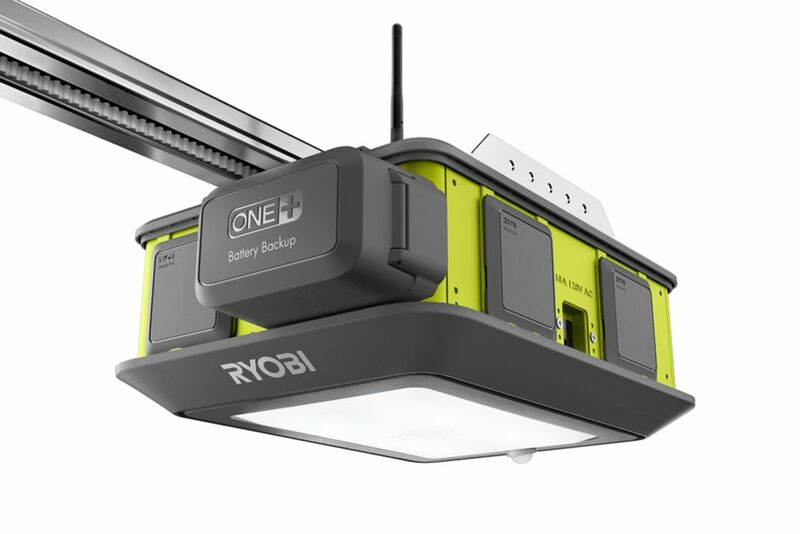 With the Ryobi Garage Door Opener, the possibilities are truly endless. 2 HP Belt Drive Garage Door Opener is rated 3.8 out of 5 by 682. Rated 5 out of 5 by POBrian from I installed two of these by myself in less than... I installed two of these by myself in less than a day each. The instructions are overly complicated, and the process is much simpler. Screw and bolt IDs are not clear, but you figure it out. Linking devices could be smoother. The lifter works very well. Motion light great. Love battery backup. Rated 1 out of 5 by Dissatisfied from This garage door opener is terrible. The app feature doesn't even work. I have been stuck in my ... This garage door opener is terrible. The app feature doesn't even work. I have been stuck in my garage twice now because the door will not open via wall button, remote or keypad! I have only had this for 6 months and Ryobi will not do a thing about it. Total waste of money! I should have stuck with the Chamberlain! Rated 5 out of 5 by Anonymous from It is as quiet as the say. For $450 installed... It is as quiet as the say. For $450 installed it is not a bad price either. The installers did a great job putting in the opener and then I needed to do the Wi-Fi portion. That took 10 minutes... And justed need some larger screws to mount to the door frame. Working like a charm. Hi Ajil1973, The maximum height out of the box is 8 feet. You can buy the extention RYOBI 14 Feet Rail Belt Drive Extension Kit. What battery would you recommend for the backup slot? 1.5, 2, 3, 4AH? I've had this GDO for 6 months and I want to ensure that I have access to my garage in the winter permitting any power outages happen. Hi RTD90, We would recommend 4AH battery.